Quick-Ties Velcro Tape | Henry Field's Seed & Nursery Co.
What a great idea! 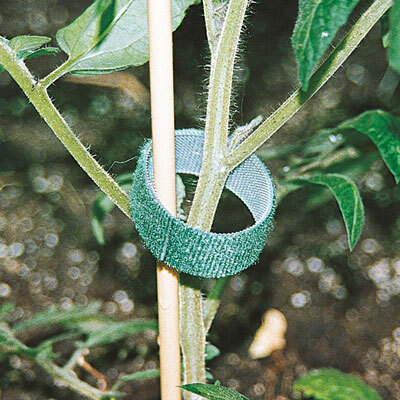 Cut off a few inches of this 3/8", double-sided, green Velcro tape to strap your tomatoes, cucumbers and climbing roses to their supports, trellises or stakes. No tying, twisting or ag gravation! This sturdy, wide band is gentler on stems than string or wire. The tape is easily removed and can be used for many years to come. For each offer ordered, get 1 Tape (10 yards).